The self-portrait and the selfie are two separate, though at times overlapping, efforts at establishing and embellishing a definition of one’s self. Qualities like medium specificity, deeply rooted histories, and traditions (or lack thereof) that define these efforts only superficially differentiate the two. What has greater weight is the selfie’s inherently replaceable and even disposable quality. If after taking a picture of oneself the results are unsatisfactory, it is easily forgotten and replaced by a new picture. The self-portrait, whether it is a carefully composed study or created in haste, often contains more decisions than could be easily erased. 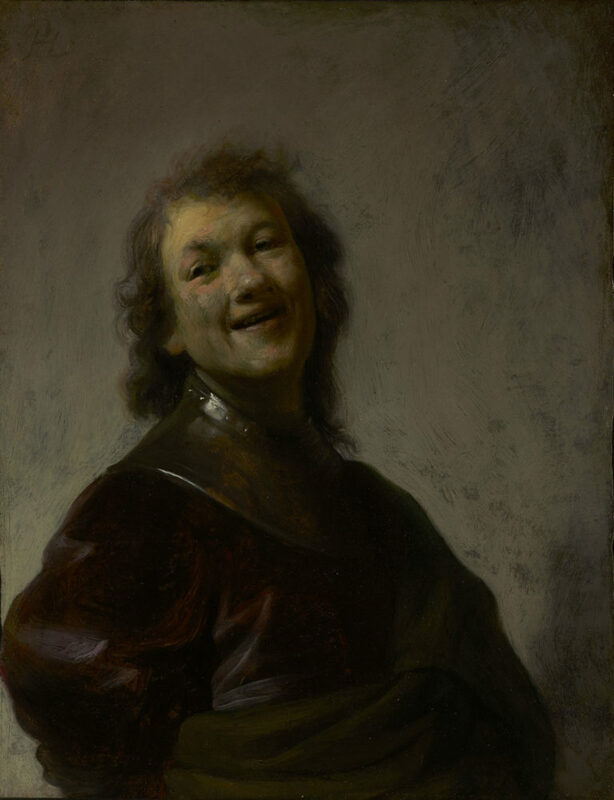 Calling a self-portrait by Rembrandt a selfie is not only anachronistic, it also negates the carefully calculated set of decisions that created the rendering. This does not mean that selfies cannot be self-portraits, or that selfies by nature require the opposite of calculated intent. An artist could choose to represent him or herself through selfies; however, self-portraits don’t immediately signify selfies. By this reasoning, ephemerality—not just medium or skill—is what makes a Rembrandt self-portrait fundamentally different from, say, a Rembrandt selfie. 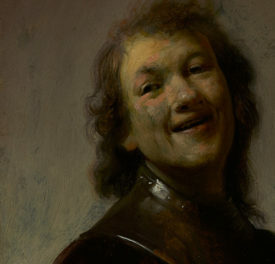 (If Rembrandt lived today, wouldn’t he be making both?) A portrait lasts, not because it is better than a selfie but because it is meant to. For a second perspective, I turned to writer and theorist Alli Burness, founder of the Museum Selfies tumblr. She kindly turned the question into a thought-provoking post on her own blog, here. Self-portraits are created to be read as art, are displayed in museums or galleries, and we are granted permission to view them as texts, functioning independently from the intent of the artist. Selfies are borne of vernacular photography practices and are brought into museums and galleries by visitors. It is perilous to read selfies in the same way as art, to ignore the context of their social interaction and the intent of the selfie-taker. It is important to remember these images are shared as part of a conversation, a series of contextual interactions and are connected to the selfie-maker in an intimate, embodied and felt way. 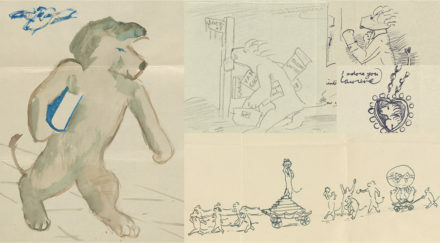 We are allowed to leave these elements out of our reading of artist’s self-portraits. My take: The selfie is a mode of conversation, inherently contextual and often ephemeral. Selfies may also be self-portraits, and both may also be art. What do you think: What defines a selfie? Is there a difference between a selfie and a self-portrait? Currently I am looking at the power of Portraits and the way that they were used by the Tudors to represent an image of themselves, used in a similar way to propaganda. I have been interested to find out how we as humans use portraits as a way to portray an image of ourselves to evoke an response. The selfie seems to be our modern equivalent of how the Tudors used portraits and the way that we use them to show of a certain image of ourselves. From an article I read on self portraits and selfies, one person stated how they use it as a way of making them feel good about themselves from a positive comment or like. It feels to me that this is often the aim of many selfies to get a response. However I am not saying this is a negative thing, but simply something we as humans have done throughout history. We want to be seen a certain way and now through easily accessible cameras and social media this is easier than ever. This is why I wanted to understand if a selfie is a self portrait, although now I don’t think it is an important question. I don’t think there is any clear line that sets them apart and I think a selfie is just a form of self portraiture. Hi Isabelle, Thanks so much for your comment. Your project sounds very interesting! I am not a selfie person. But I recognize something that you have pointed out here Annelisa and that is that selfies are a personal form of chatting rather than a permanent starting point for a larger narrative. There is a sinister effect of Hot-or-Not selife culture however, that happens when the chat is not a statement but interrogative; “How do I look?” This is when social bruising is almost invited into the chat. I wanted to blur the lines further in my art/psychology project that elevates selfies, especially the interrogative ones, to become part of a larger narrative. Although I’ve not enough crowdsourced input to be highly accurate yet, the algorithm selects imagery associated with the personality and mood of the selie taker. People using the platform are calling the results “inner selfies” as they have much greater context and often more “story.” The additional context allows the images to be shared as visual messages intended to start conversations… the verbal kind. I have never thought of these collages as self portraits until I read your article. But I guess that’s been the purpose of the project all along. I would be curious to know what readers of this article think. 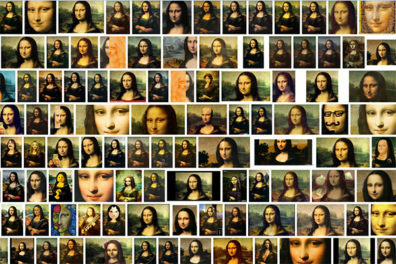 I doubt there is a way you could say some of the inner selfies are selfies and others are self portraits since the artificial intelligence that “designs” them doesn’t know the difference… yet! Generally, selfies aim to capture a moment in time, a reflection of the surface. A self portrait’s aim tends to be to capture a timeless quality inherent in the subject, a deeper revelation. But, what is art, really? No doubt, as selfies develop, the distinction between self-portrait as art and self-portrait as selfie (presumably not art) will become nebulous and, just as we eventually accepted Duchamp’s urinal as art, we’ll grow to accept certain iterations of selfies as art. Do a search on the internet for “selfie as art” and you will find museums that dedicate themselves to selfies or museums that put up shows of selfies. So, applying the the notion that art is what a museum chooses to show has already been torn down in the case of selfies. Also, some professional artists (as opposed to those of us who “create” for leisure or pleasure) have begun to turn selfies into artistic projects. Perhaps, we’ll look back to this time and see selfies as another artistic revolution, like Impressionism or the avant garde ushered in by Marcel Duchamp. Even so, none of this negates the fact that selfies are, for many, a form of narcissism or self-affirmation. A way to be counted in an increasingly complex and anonymous world. Recently I was criticised by a close family member (mother-in-law) for posting too many “selfies” when instead I was only posting updated profile pictures as I lost 13 kg in 3 months. Needless to say I was annoyed…am I the only one to see a difference between taking selfies vs. Updated photographs or yourself? Why would I want to keep a picture of myself, infinitely heavier??? to me, self portraits are a surreal, almost magical image of ones self. I think that there is a world worth of more meaning behind a self portrait than could ever be in a selfie. The fact that selfies are mass produced alone takes a huge toll on the importance of them. When one looks at the face, they should see a masterpiece. When masterpieces are viewed constantly, they lose a sense of mystery. In my opinion, a selfie is an unprofessional photo taken of yourself by yourself. In a selfie, you can see that the angle of the camera is most-likely tilted. There may also be some blurry parts. A selfie most likely contain a strange facial expression of that compared to a simple smile or resting face of a portrait. Portraits tend to have more of a professional approach. Unlike a selfie, a self portrait has both of the arms of the person down. Many would use a timer or a clicker to capture the photo. In a self portrait, the person is capturing a photo of themselves by themselves. It is more of a photo that would be seen on a passport or driver licence. What do you call the old shots then we took with a camera and film? Are they still selfies? That’s a good question. I am guessing here, but my vote would be that those are closer to self-portraits than to selfies. They’re not part of a conversation (in the sense that selfies posted to social media are), and, even though spontaneous, they do not seem disposable. I have old film-photographic “selfies” and pictures of relatives that are definitely not art, and I can never seem to dispose of the negatives and old contact sheets. If these same photos were on my phone, I wouldn’t hesitate to delete them. But perhaps that’s just my inner non-digital-native hoarder coming out. Would be curious to hear what others think. Is the selfie a self portrait? It all depends on the perception and interpretation of the viewer. To me not all art is art, just as all food is not palatable and we all see the same things with different eyes. To me a selfie is defined as something that is taken electronically to share small parts of one’s life. Although it is called a selfie I ironically feel that a selfie is not for one’s self at all. When someone takes a selfie of themselves on their phone they aren’t usually taking it so they can have a nice picture of themselves to look at on their phone, but no judgement if that’s what you are doing it for. A selfie to me is a form of quick communication, it is meant to feel more personal than a text because instead of just telling someone what you are doing you can show them. I think of a selfie as a way I can send someone an ugly picture of myself and not have to worry about it sticking around. It is a way represent yourself in everyday life without too much meaning behind it. I find more and more though that most of the time a selfie doesn’t even represent someone’s true self. People use selfies as way to depict how they want to be seen, they can choose their own angles, put the newest filter on themselves, and make things appear different than what they are. That to me is what separates a selfie from a self-portrait, showing what you think people want to see and showing what you see. Selfies are a conversation and what I mean by that is selfies depend on who you are sending it to or what you want someone else to think or see. A self-portrait is a statement and by that I mean something that cannot be altered by the idea of who is going to see it or what someone might think. For me there is a strong difference between a selfie and self portrait. the difference between a selfie and a self portrait is that in a selfie you hold the phone up and you take the picture by yourself or with family or friends. in a self portrait that a portrait of an artist made or created by the artist .